MISSION STATEMENT/GOAL: To create and offer a collection of songs that inspire, encourages, enables others to gratefully praise, worship, confess and petition the Lord, and draw closer to the Him in all their ways, whether in a group of people or by oneself. Dale and Amanda Huntington: "Shine like Stars has had many members but the heart has stayed the same: to help others worship God; We want to help you better say what you want to say to God. That is why we write songs. That is why we play. It may sound a little weird but we are happiest when the attention is not on us but God." Printed with permission. All songs written by Dale Huntington, except REDEEMED, that was by Tim Yee. High-energy Praise & Worship - Celebrating Jesus Christ as Lord and Savior. Partial lyrics: "I've been redeemed/I've been redeemed/Washed and cleaned/I've been redeemed/"
GOSPEL - Celebrates our victory in Christ, because He redeemed us on the cross. GOD OF REMBRANDT Celebrates and praises the Lord as the creator of our world around us. HE'S COMING BACK - Ballad of celebration, of what the Lord did for a person in the depths of loss and sorrow; comforting, giving joy, love, salvation and a way to express what happened in a song. Takes joy in the the promise that Jesus will come back for his believers in the end times. HUMBLE BEGINNINGS- Explores the humble beginnings of Lord Jesus, and his purpose in this world, which he accomplished as an adult. PS.116- I LOVE YOU - A love letter that worships and shows gratitude for answered prayer. FORGIVEN- (Romans 7:15-25) Confession of sin, grateful for the Lord's forgiveness, mercy and love,. NOT ONLY IN A SONG - Confession of failing the LORD, grateful for the Lord's grace, his refuge, Asking for help in living lives, and in worshiping HIM, the lamb of God., ending with praising Him. Partial Lyrics: "LORD, we fail you every day, and often does our faith, but when our sin abounds, so doe your grace." "Fill us with your spirit and anoint us with your words/ The path which we should walk/ the desire of Your heart"
JUST A PLACE -Petition for the strength, love, compassion of the Lord so we can serve Him individually and as his church, helping those in our lives who need help. Becoming a breathing sacrifice - dedication to the Lord, through the transformation, power of the Holy Spirit. BOUND TO BE HOLY - Breathing sacrifice - dedication to the Lord, through the transformation, power of the Holy Spirit. Holy Spirit Lead - Petition for the Holy Spirit to open hears and eyes, and lead us in the right direction into God's will for us. Also a commitment to trust the Holy Spirit to guide our lives. 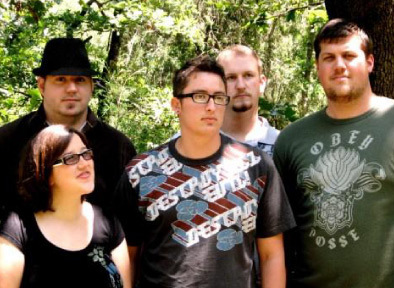 SHINE LIKE STARS - Is a 20-something aged group of talented Christian musicians with a heart and enthusiastic spirit for the Lord, led by Dale and Amanda Huntington, lead vocalists. This talented, dynamic pair are on a mission to inspire commitment and grateful thanksgiving for our Lord and Savior Jesus Christ, as well as encouraging a closer walk with the Lord, offering music for any worship need, in language that we all can relate to and use. 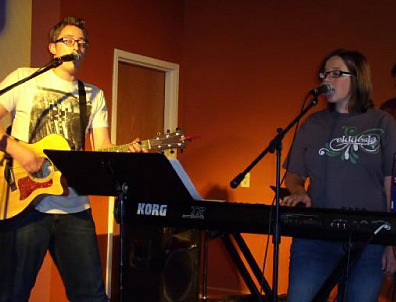 When they were on the music worship team for their former home church in California, and now serving as worship music leaders in their current Wichita, Kansas, church, they have written anthems of petition, prayer, confession and praise and worship, that they have used in their church worship services, and now offer the same experience for Christian music enthusiasts everywhere, thanks to their collection of songs, entitled, "SEE YOU THERE." 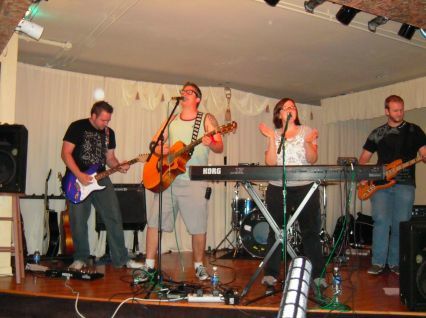 Their devotion and love of the Lord flows with a dynamic enthusiasm, creating a variety of songs, whether one hears fast-paced rock praise and worship such as: (REDEEMED), spirited, pop tempo anthems, such as; (SEE YOU THERE), or expressive, melodious, meditative worship and petition prayer hymns/anthems created in a variety of tempos, such as; (HOLY SPIRIT LEAD * BOUND TO BE HOLY). Not only are they on fire for the Lord, they also have considerable talent, which was front and center on our Brumder Mansion ballroom stage, in Milwaukee, Wisconsin. Talented and gifted Dale and Ashley Huntington and their other band members came to our Brumder Mansion theatre stage while they were on tour in the summer of 2010, and gave us an interview, and took part in our 2 night Christian rock house concert, along with two other bands, SAVED BY GRACE, and the ERIC BASS BAND. 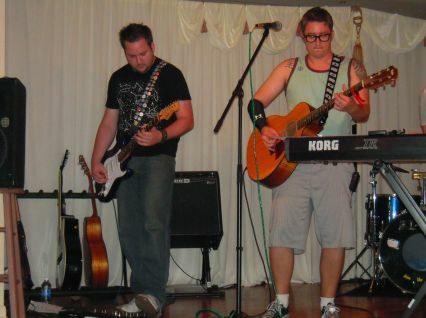 Hearing and witnessing a live performance really makes it clear to this reviewer all the elements of their music and vocals that make their songs so powerful and effective in bringing the message of the Gospel to the younger generation and those who are young at heart, and enjoy a blend of acoustic/electric contemporary rock. Throughout this collection of songs, the listener enjoys all the musical qualities and gifts of the Huntingtons and their crew of talented musicians offer in their music. Dale & Amanda and their band understand how to create infectious melodies, spirited rock tempos, effective, excellent dynamics that build throughout the compositions, paired with meaningful, yet easy to remember lyrics. The spiritual messages heard via the vocals are presented with spirited, enthusiastic, expressive vocals of the Huntingtons. 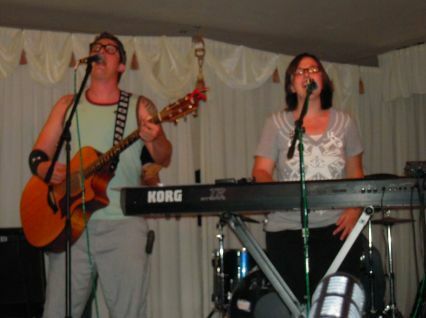 Dale and Amanda's wonderful harmonies and personal spirituality flows through the vocals as a driving force. All these qualities heard in the music come together to present the lyrical message front and center in the most wonderful way! Great contrasts and use of acoustic guitars with electric guitars, keys and drums, used to accent the dynamics heard, adding to the emotional rush of these songs. Their High-energy, rock-style Praise & worship anthems really inspire with a youthful gusto and spirit, celebrating Jesus Christ as Lord and Savior; praising Him for the hope we have in Him, because of who he is in our lives in this world, and the next; Their joyful, dynamic sound is a sure crowd pleaser, inspiring dancing in the room, as well as enthusiastic worship of the Lord, involving both mind and spirit. The use of dynamics to bring the spiritual message front and center is most inspiring. REDEEMED - My personal favorite praise and worship song, that sweeps away the stress of the day! Intro starts quietly, yet is pumping with an energetic spirit as an acoustic guitar, with drums and support by electric guitar get this song of f to an energetic start. Dynamics build in joy into the first chorus, but quiet down for the 2nd verse in the spirit of worship. 3rd verse is almost a Capella, with instruments as accents. Chorus is joyous and celebrates redemption! Has an irresistible energy and enthusiasm, sure to stir and uplift the soul and heart of the listener to be excited about the Gospel of Jesus Christ, and share the good news about our salvation through HIM. Propelled by a peppy rock beat, smoking electric guitar work that provides support for both the lively melody and tempo. It all cooks along with a spirited energy, matched by equally energized vocals, with lovely harmonies included. Terrific, easy to remember chorus, that is high energy, boisterous and joyous! Chorus is the highpoint, a rallying commitment to not be ashamed of the good news of Jesus Christ! GOD OF REMBRANDT - One can describe this song as a wonderful blend of rip-roaring rock, precisely played, interspersed with quieter acoustic accompaniment during verse phrases, where the vocals lovingly express the wonders of God's creation. Begins with an acoustic guitar introduction, and builds from there in energy and intensity. Features a rip roaring interlude with a creative electric guitar riff. HE'S COMING BACK - The energy, celebration and joy begins at once in the fast-paced rock intro, which pumps throughout the song, never letting up. Yes indeed, the listener is treated to the full rock package up until the bridge, where it quiets down a bit, but segues once again effortlessly into a song of jubilation! During verses, the acoustic guitar ensemble gets a workout, playing an invigorating accompaniment, with the electric guitars and keys providing chordal and accent support. Smoke must of been coming out of the recording session! Sure to get the listener to dance around the room, forgetting earthly troubles for a moment, as the promise for believers is that we can look forward to going home with Jesus someday. Anthems of Jubilation & Hope we have in the Lord Jesus- Again, dynamics, intensity, energy, inspiring melodies and spirited accompaniment complement and uplift the equally inspiring vocals by Dale and Amanda Huntington. All of these are a wonderful blend of acoustic guitar during the verses and enthusiastic- to subtle electric rock at a variety of tempos, during the chorus and refrain. 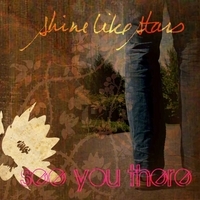 SEE YOU THERE - Bright, acoustic pop-rock anthem that moves right along with a snappy tempo. A wonderful blend of acoustic guitar during the verses and enthusiastic electric rock, during the chorus and refrain. Bridge quiets down in a solemn mood, with just acoustic guitar and group vocals, but picks up again in the chorus. A wonderful blend of acoustic guitar during the verses and enthusiastic electric rock, during the chorus and refrain. pS.116- I LOVE YOU - A Strong Favorite of this reviewer. Acoustic driven love letter with interesting counter-melody instrument voices. Features a beautiful melody carried by the vocals that express so well, the spirit of gratitude and a thankful attitude to the Lord, as first expressed by David in Psalm 116. Duet again is very uplifting and memorable. Perfect song to end this collection of songs, as it presents the Gospel message in a musically dramatic way. Written in a minor key, begins softly, poignantly, like a lullaby, yet spirited with acoustic guitar accompaniment, supporting just Dale's vocals. Expands in dynamics and musically into an anthem of worship in the refrain, as other instrumentation join the acoustic guitar and light drums, about 6 measures before the broad refrain. Dynamics again quiet down during the 2nd verse. Bridge is strong and intense with emotion, but it quiets down again for the first stanza of the refrain. 2nd stanza again swells in volume for a grand finish. Confession & Petition /Worship Anthems - Well-presented, poignant songs that truly encourage a spirit of repentance, condusive to heart-felt confession, and to feel gratitude for God's mercy. Songs lyrical messages say it so well, in both confessing common sins, gratitude to the Lord, and in asking Him for help. NOT ONLY IN A SONG - Acoustic-based, mid-tempo, anthem of confession and petition, that begins with simply broken chords played by a guitar, that builds as light drums and electric guitar playing counter melody/rhythm, join the accompaniment. Verses start softly, with guitar ensemble support, and the beautiful vocal duet of the Huntingtons carrying the memorable melody as well as presenting the theme of the song. Sound builds to the refrain, which is full of energy in worshiping and petitioning the Lord to help us to stay on the right path. Bridge is straight praise, full of gratitude and thankfulness. last time through the chorus is at full volume. FORGIVEN - A Strong Favorite of this reviewer. This memorable, hymn of confession and gratitude, begins softly, reverently with synthesizer, poignant acoustic and electrical guitar backup playing broken chords. Lovely heart-felt vocals beautifully express the sincere message of confession and repentance, as well as carrying the lovely melody, so appropriate for this song. Stays soft and expressive throughout the verses expressing human weaknesses we are all guilty of. Sound swells in refrain for great affect. Expresses perfectly in both the composition and vocal presentation a prayer we could all use to confess our sins and ask for forgiveness. Prayer Anthems & Hymns of Worship and Petition - Songs have reverent, beautiful melodies, heart-felt lyrics, expressive vocals, yet have an underlying spirit and make use of dynamics, which have the effect of lifting the listener into the spirit of worship, and into the presence of the Lord. Interestingly, this effect is acomplished with memorable melodies paired with a variety of pop-rock tempos. Most beautiful, reverent melody and vocals, which just sweeps over the listener with an uplifting aura of worship. Accompanied half-way through with just a synthesizer and acoustic guitar. Last two times through the refrain, the drums and electric guitars come in to lift the dynamics up a notch or two, and infuse some youthful energy and spirit. tight supportive sound suggests that the musicianship of the guitarists is well developed! Ends on a quiet note. HOLY SPIRIT LEAD - Favorite anthem of this reviewer - A lively prayer of petition spirited acoustic guitar and Dale's voice begin this prayer of petition for the first verse. electric guitars and drums jump in at the chorus/refrain, adding energy to the song's prayerful petition. Peppy tight rock support of tempo, provided by guitars and percussion begins in the refrain, and quiets down again in the Second verse, yet is still there, providing an underlying energy. Amanda sings, and they harmonize again in the chorus/refrain. Beautiful harmony, expressive vocals bring the message front and center. JUST A PLACE - Easy rock beat, great electric guitar intro rift of moving eighth notes, played with gusto, gets this song moving. Beautiful, memorable melody and vocal duet supported by acoustic guitar and light drums in the verses. Electric guitars provide chordal support during the refrain. Sound builds through the Bridge, and last time through the refrain. Ends on a quiet note. I highly reccommend SEE YOU THERE to contemporary music enthusiasts, and the Christian music lovers with open minds who enjoy energetic, spirit-filled compositions, that offer not only a variety of dynamic tempos and moods, but also most enjoyable vocals and duets. The musical dynamics, contrasts in intensity, and the flow of energy are the best that I've heard in a very long time, in this genre of music. The music and vocals work together to express the spirit of worship, in words and music that we can relate to and use in our own worship time, or be inspired in group worship as well. SEE YOU THERE is an effective musical tool that heightens all aspects of worship, and is a MUST HAVE for the younger generation, and those who enjoy contemporary Christian Music. heard and bought on CD BABY and Amazon.com.